One of the fall’s biggest trends this year is actually really easy to incorporate into your work day wardrobe. Velvet is perfect (in small doses) for your office style. The above items are my favorite currently available velvet pieces. I really like that the velvet trend is, for the most part, sticking to really rich hues in burgundys, blues and blacks. These are colors that are easy to pair with grey & black work wear. 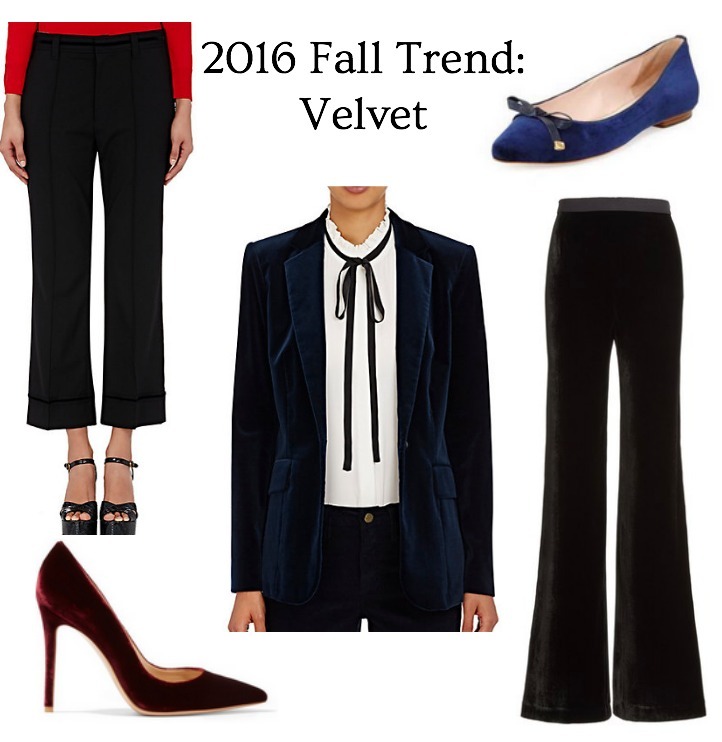 I think my first velvet item will have to be either the heels or loafers – such a great way to ease into this fall/winter trend! In other news, in response to so many great reader/follower questions (thanks guys!!) I’ll be doing a second Facebook live Q&A focused on beauty later this evening. “Like” my facebook page and tune in to see the video! If you’ve got any last minute beauty questions for me, let me know! "Work Wear Outfit Ideas for Fall"
I've been loving all things velvet lately too! Its so luxe for fall and winter. You should get both heels and loafers lol! Too hard to choose between. Exactly! It just has such a feeling of sophistication. Haha right?! Who can choose?! Clearly both is the answer. I love velvet ! Great pieces. Thanks for sharing. Thank you for reading Marie!! Glad you like these pieces! I am totally all for velvet! I love your pieces you've chosen! Thanks Ruth! I saw another pair of gorgeous burgundy velvet heels at winners this weekend – Im so tempted to get them! That velvet blazer is beautiful! Isn't it great?! So luxe.